Social media is more than just a way to keep up with your friends and share fun links and photos. It can be a powerful tool in a dental marketing agency’s strategy to help your practice gain more patients and increase revenue. Dental social media marketing involves posting useful content, interacting with other users of social media platforms, and employing other tactics to build your brand online. Learn how your dental practice can begin using social media to attract new patients and retain current ones. Implementing social media in your digital marketing efforts can yield countless benefits. Most importantly, it can be a major factor in increasing your inbound website traffic. With each social media platform you create, you also create another way for people to access and discover your website. All of the content you post on these profiles becomes another way for you to demonstrate your knowledge and build a reputation as a credible and reliable dentist. Moreover, different age demographics tend to use different social media websites more frequently, and posting on a variety of social media platforms can increase traffic to your dental website from a wide range of potential patients. Brand recognition and loyalty are a major benefit of dental social media marketing. Potential patients already use social media on a daily basis, making your brand easily accessible to them through status updates and other posts. 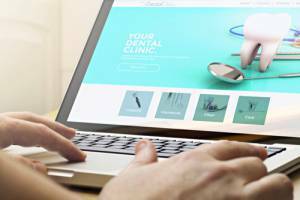 With constant online exposure, your brand will become more familiar to your potential customers, ensuring that they habitually turn to your practice when in need of dental services. In addition to better recognition of your brand, social media can help make people more loyal to it as well. When people share your dental content, like it, or comment on it, other people will see the interaction between your brand and their friends’ news feeds. When the brand is endorsed by a trusted connection, individuals are more likely to trust your brand as well, and may potentially inquire about your dental services. Dental social media marketing allows you to engage with people in ways that are nearly impossible through other forms of marketing. For example, people who view your content online will likely use the comments section below it to post questions or ask for clarifications about your services. By interacting with these users and answering their questions, you open up another opportunity to share your expertise and demonstrate that you are a trustworthy and reliable choice for their dental care. This interaction humanizes your brand and helps the user’s feel that you have their best interests at heart, more so than a brand that does not deliver timely customer service. In addition, by tracking the number of times people interact with your content, a dental marketing agency can tailor you marketing strategy to help better target your ideal audience. Posting original content that illustrates the difference between your dental practice and the competition is an excellent way to highlight your expertise and maintain credibility. Creating and publishing content such as information about services or discounts, as well as infographics pertaining to that information, helps users better engage with your brand and what it offers. It may also be effective to post relevant content from other industry operators, such as quotes, to prove that you can understand and recognize good advice and best practices, no matter the source. Both of these methods show potential patients that your practice is up-to-date on the latest medical technology and practices, helping them feel secure in scheduling an appointment with you. Engaging with potential clients and those who regularly visit your practice is a critical component of dental social media marketing. While many practices choose to keep their distance from the general population and instead rely solely on referrals, interacting with new users who are unfamiliar with your practice is generally preferable among new users. Answering questions, providing links for further reading, and encouraging commenters to call your practice for an appointment or for further information both humanizes your brand and demonstrates a genuine concern for the well-being of individuals’ dental hygiene. Displaying social media content on your practice’s website can also boost revenue. According to research, a large number of consumers actively rely on social media to help them make purchasing decisions, and the same holds true for choosing dental care providers. You may want to consider highlighting recent tweets, Facebook posts, and Instagram photos in a special section on your site. This way, people do not have to actually be a follower of your brand on any social media platform in order to be exposed to your content, but may choose to follow you in the future. In addition, creating a page on your website that automatically populates with reviews and comments that people have posted on your practice’s profiles can help build trust between your practice and the site visitor, who can see that other people like them approve of your services. Providing guest posts on the websites of other local health care providers could provide a free endorsement from the business and expose your practice to a new market of potential patients. You may also consider posting announcements, such as recent awards or new service promotions, on your social media pages with an accompanying press release. Not only does this save your practice valuable marketing dollars that can be used elsewhere, it can also encourage patients to celebrate your successes with you. We hope this article has helped you consider how dental social media marketing can increase your revenue and website traffic. Frequently generating content to post on multiple platforms increases your chances of reaching more potential patients. Furthermore, by segmenting your message based on the platform you are using, you can disseminate your content based on diversified target audiences. This can contribute to more qualified leads and clicks each day, further increasing your chances of them becoming future patients. Keep in mind: this may be challenging to execute, especially when running your dental practice and keeping up with the demands of patients. Outsourcing your social media efforts can significantly improve your marketing efforts and brand’s relationship to its clients and potential patients. Speak with a professional dental marketing agency today to schedule a free dental social media marketing evaluation. 321 Web Marketing creates customized social media marketing plans for each of its clients and continues to monitor the performance of campaigns well after launching to ensure their success. Contact us today for more information about starting your dental marketing campaign or to schedule a consultation.